One time purge services are required to destroy documents in storage that have met retention dates or when you need to clean office files. Our shred trucks shred 5000 lbs/hr or 170 banker boxes/hr allowing for quick destruction. If you have a trash bag of documents or a storage unit with hundreds of boxes we are eager to earn your business by saving you time and money over other services. 1) Shred Truck arrives on time to shred your confidential documents. 2) Crowe Shredding specialists dump your files into secure totes directly from storage boxes and transport to on site shred truck for immediate destruction. 3) Your documents are immediately loaded and destroyed by our automated precision shred trucks. The shred chamber is secure and can be viewed remotely by watching the monitor on the operators panel. 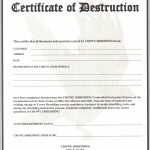 4) Certificate of Destruction provided upon completion of each service. Save 20% over shredding in-house and reduce liability risk by using our routine secure collection container service. Operating an office shredder is such a mundane and distasteful task resulting in many documents that were supposed to be shredded, being thrown in the trash. Also, "seventy percent of information theft is committed by insiders, such as temporary workers, contract workers, disgruntled employees and people moving to other companies" (Business Week 1998). In today's business environment, companies are required to take every precaution to protect individual's personal and/or company trade information. Businesses have an "implied contract" to protect the sensitive information that they routinely gather in order to conduct business. The casual discarding of information exposes customers to the threat of "Identity Theft" and other fraud. Consumers have the legal right to expect you to take every precaution to protect their sensitive data, including shredding it before it is discarded. The Supreme Court has ruled that anything thrown into the trash becomes public domain and anyone has the right to simply take it. Protect your company and client’s information, your reputation and comply with government regulations by using Crowe Shredding and our routine secure collection container service. 1) Clients drop sensitive documents in secure collection containers located at convenient points in your facility. No need to walk far, remove staples, paperclips, file folders or electronic CD’s. Containers are provided free of charge! 2) Shred Truck arrives on a regularly scheduled time to shred your confidential documents based on your volume. 3) Shred specialists greet your staff with a friendly smile and minimal disruption by emptying your sensitive documents into a secure tote for transport and immediate destruction via our on site shred truck. Typically, we require 2 minutes per container to service your account. 4) Your documents are immediately loaded and destroyed by our automated precision shred trucks. The shred chamber is secure and can be viewed remotely by watching the monitor on the operators panel. 5) Certificate of Destruction provided upon completion of each service. Video of documents being dumped and shredded by secure shred truck. Sponsor a shred day for your clients or the community as a great way to market your business. Identity Theft is the fastest growing crime in the world and our service is invaluable for the greater community to allow families to destroy confidential documents. Provide a valued service to the community and introduce your business to those who take advantage of the shred event. All Shredded Waste is Recycled Locally! We offer collection totes to allow clients to recycle all non confidential paper waste for recycling. Every ton of shredded paper recycled saves 17 trees from harvest and 3.12 Cu/ft from the landfill. Crowe Shredding recycles greater than 500 tons of shredded paper each year and with our continued success we will double that number in the near future. Join us as Green members of the local community and recycle your paper waste with our environmentally friendly service. Shredit all with Crowe Shredding!